When was the last time you’ve been to a place you had ZERO preconceived notions about? When I landed in Sofia, I walked out of the dingy Soviet airport and into the sun, only to find myself surrounded on most sides by snow-capped mountains. Mountains?! I hadn’t even known there’d be mountains! That’s how little I knew about Sofia before visiting last March. How much I loved the city, especially with all the delicious vegetarian and vegan restaurants in Sofia to explore! 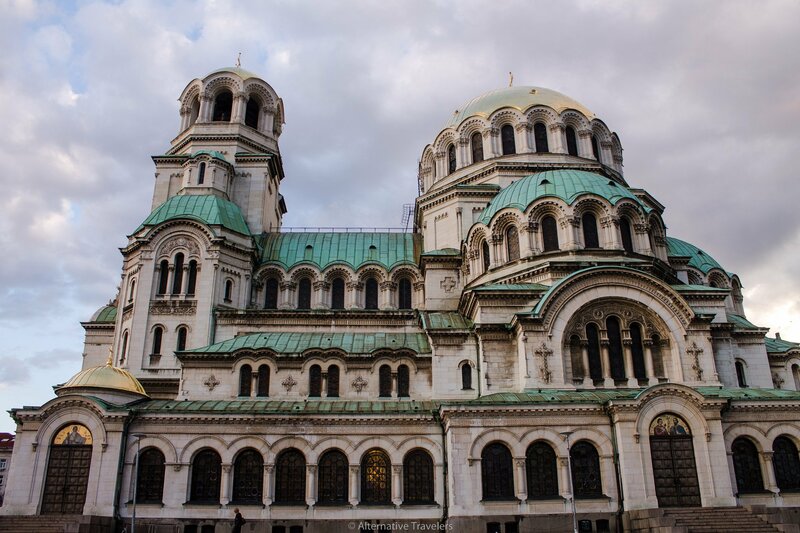 I visited Sofia as part of a vegan Lent trip with Caitlin of The Vegan Word and Laura of Vegan Vs Travel, who met us in Belgrade (check out her Vegan Belgrade guide). During Lent, many people in many Orthodox countries do not eat animal products. That means traveling in these countries is a boon for vegans during this time. Lent changes every year but occurs generally between February-April depending on the year. Read more about vegan Lent and travel in these countries in Caitlin’s great post: Why Vegans Should Travel to Eastern Europe During Lent. We started our #VeganLentTour in Sofia as we found great prices on flights from Madrid (where we used to be based) and London (where Caitlin is based). It was cold but not too cold to enjoy exploring the beautiful and incredibly historic city. Plus, it’s very affordable to travel in the Balkans, and not overrun with tourists like many Western European cities. If you’ve heard anything about Bulgarian food or Balkan food in general, you’ve likely heard it’s meat and dairy heavy. And it’s true – this does play a big part in traditional Bulgarian cuisine. But good news for traveling vegans: there are many great vegetarian and vegan restaurants in Sofia! Vitosha Boulevard, the main thoroughfare in Sofia, Bulgaria. Note the mountains in the background! There aren’t many vegan restaurants in Sofia, but the ones that exist are definitely worth your attention! We were so excited to find this place on our last day in Sofia! When we visited in March of 2018, it had just opened that previous week! We only found out about it when a local responded to Caitlin’s Instagram story about looking for vegan food in Sofia. This place was easily one of our favorite spots. We tried about half the menu right before we headed off on our bus to Serbia. The woman running the spot couldn’t be sweeter, and the portions are generous, especially considering how cheap it is (even for Bulgaria). We devoured the un’chikn wrap (seitan based), quesadilla (they use Violife cheese, oh so melty! ), and a beautiful homemade burger. It’s a small spot with only a few places to sit, so most people get food to takeaway. If the weather is nice, you can eat your meal in the archaeological park just across the street! Bring your reusable takeaway container to reduce waste on the go! Soul Kitchen is a great vegan restaurant in Sofia that’s perfect for a special occasion meal. It’s much more expensive than any other vegan Sofia eats we found, but worth it. It’s slightly outside of the downtown and across the river. The restaurant itself has a beautiful, airy space with large wooden tables and huge windows that streamed sunlight into the room. The staff is super lovely and helpful. They spoke great English and are happy to answer any questions. Soul Kitchen offers a variety of dishes, from pizza to pasta, as well as many traditional Bulgarian dishes – made vegan! Don’t miss the chance to try tarator, a classic vegetarian Bulgarian dish. Tarator is a cold soup made from yogurt, cucumbers, walnuts, garlic, and dill. Their yogurt is a homemade cashew version. Just be aware that the soup is cold! When we ordered it in March, we were expecting a hot soup and were quite surprised when it arrived into our mouths! Tarator, a traditional cold Bulgarian soup. Our favorite dish was one we likely wouldn’t have chosen had someone not recommended it to Caitlin – the porcini and truffle tagliatelle. It was so creamy that we were talking about it for days afterward! There is a rotating selection of homemade desserts, and the cheesecake we had was quite delicious. Loving Hut is the third vegan restaurant in Sofia and the only one we did not try. An international vegan chain of restaurants, we’ve tried their locations in Madrid and Brighton and were disappointed both times. I generally avoid Loving Huts as I find their food bland, greasy, and not traditional food from whatever country I’m visiting. However, we are glad that this vegan franchise exists as they’re all around the world. This Loving Hut offers dishes like quiche, pizza, sandwiches, raw soups, smoothies, and salads. The location gets great reviews though, so it’s worth a shot if you’ll be in the Bulgarian capital a while. We prioritized more interesting local vegetarian restaurants in Sofia, which I’ll share in the following section. While there are only the three (above) vegan restaurants, there are about eight different vegetarian restaurants in Sofia. Add in the four locations of Sun Moon, and you have twelve spots for vegetarian food .in Sofia This might not seem like much if you’re used to vegan hot spots like the top 10 vegan cities in Europe. But for the Balkans, where veganism is still growing, it’s quite impressive. Most visitors won’t stay long enough in Sofia to exhaust all their options. There are even more places offering vegan options, as well as traditional Bulgarian restaurants where you can find vegan food (see recommended dishes in section below). Sun Moon has four locations, so you’ll have no trouble finding one, no matter where you’re staying. We stayed just down the street from one of the locations (see our accommodations recommendations at the end of this post), so we went for lunch on our first night and breakfast on our last day. The bakery has a wide variety of delicious vegan treats, all helpfully labeled and listed in both Bulgarian and English. We tried several banitsa (traditional Bulgarian breakfast pastry) and got a few local vegan cheeses to taste from the fridge in the grocery section (not really impressed by those). Lunch was delicious and affordable, and the space at the location we went to was super cozy and inviting. The staff was very nice and helpful – a perfect welcome to Sofia! Definitely don’t miss Sun Moon if you’re looking for vegan food in Sofia. Veda House was just a few steps away from our guest house, and a lovely place to spend an evening or day if you’ve got some work to get done. It’s one of the several vegetarian tea houses in Sofia. They have an extensive menu featuring tea-inspired dishes and a huge tea menu with traditional Bulgarian teas as well as countless others. You can sit downstairs or in the upstairs area, where you take off your shoes and sit on the carpeted ground. Super cozy! We really enjoyed our meal here, the place is so peaceful and quiet. Note that it’s pricier than other places like Sun Moon, but we felt it was worth it for the quality of food and atmosphere. The menus are in Bulgarian and English, and the lovely staff is more than happy to explain things to you. Dream House is another vegetarian tea house in Sofia, right smack dab in the center of the old town. We didn’t try this one due to a limited amount of time in Sofia, but it’s been rated highly by others, so we figured we’d give it a mention. They’re one of the oldest vegetarian restaurants in Sofia, serving up hearty mostly plant-based food for around ten years! The menu at Dream House is vegetarian but mostly vegan, with options clearly marked. It’s a bit difficult to find as it’s not on the street level, but we were able to easily locate the sign just passing by. They offer a wide variety of foods, from several salads and soups to internationally inspired main dishes. Their plates are around 6 BGN ($3.50/3 euros), so extremely reasonably priced. Kring is another vegetarian restaurant in Sofia that’s mostly vegan. It’s a buffet-style place where you load up your plate and pay by the weight. Pricing depends on how much you can eat! Most dishes are vegan and everything is appropriately labeled. They make their own tempeh and seitan which features widely in their dishes. As noted above, veganism is still in its early stages in Bulgaria. Don’t expect to find vegan options at run-of-the-mill restaurants like you might be able to do in NYC or London. If you’re familiar with our vegan city guides, you’ll know we never leave out a place we didn’t like, or paint a place in a better light than our actual experience was. I often see this in vegan blogs when I know for a fact the person didn’t have a good experience. This does nothing but do a disservice to fellow vegan travelers (not to mention also not challenging places to do better with constructive criticism)! So with that disclaimer, on to Salted Cafe, which, needless to say, we did not enjoy. The coffee was so watery and tasteless that neither Caitlin nor I could finish it, and we’re avid coffee drinkers. The wraps we got were equally bland and lacking in flavor. It’s unfortunate as the people and atmosphere were quite nice, and we spent a while working there. As we travel full time working online, spending time in cafes is something we always need to (and like to) do in each new place we visit. There’s lovely local artwork on the walls of the spacious cafe and it seemed to be a real hangout spot for studying. Unfortunately, none of these things could save the food, of which there weren’t many vegan options either. Some people rave about this place online but these two well-traveled vegan foodies were not impressed. While we didn’t make it to SupaStar in our trip, it’s worth including in this vegan Sofia guide as several other vegans and vegetarians recommended it. They’re a soup spot with a soup bar and other lunch options like salads and sandwiches. They offer several vegan soups daily that are clearly marked and affordable! Turshiya: pickled vegetables, such as celery, beets, cauliflower, and cabbage. These salads are traditionally eaten with a glass of rakia, the ever-present liquor in the Balkans. Rakia comes in many flavors (there is a honey one so be aware of that) and is oh-so-strong! Like in the rest of the Balkans, there are several spreads that are vegan. In Bulgaria, Kyopulu (a roasted eggplant and bell pepper spread more well known as the Serbian word Ajvar) is your friend. So is lyutenitsa (peppers, carrots, garlic, vegetable oil, sugar, salt, and tomatoes). Finally, several traditional Bulgarian stews are vegetable-based, however most of them will use butter for cooking, or stir in yogurt. You’ll find these vegetable-based stews on many menus. If you are able to communicate, you can ask if the dish contains dairy. Bob chorba: a famous national Bulgarian bean stew made from beans, onions, tomatoes, carrots, and various herbs. Traditionally a common stew served at Bulgarian monasteries. Smilyanski fasul: another bean soup, made with Smilyan beans. By getting creative with salads and relishes that are normally listed as starters, you’ll be able to assemble yourself a filling, traditional vegan Bulgarian meal! We’re not party people and prefer to stay in guest houses or small hostels when we are not house sitting. On this trip, Caitlin and I stayed at Canape Connection, a lovely guesthouse that’s perfectly located for vegans. It’s right on the same street as Veda House and Sun Moon! The staff is lovely and one of the woman is vegetarian with a lot of vegan friends. She told us where to get vegan cheese and other goodies! One of the great things about Canape Connection is that there are a variety of rooms for different needs. These include an apartment, various rooms in the guest house, even a 6 bedroom apartment if you’re traveling in a group! Click here for current availability and rates at Canape Connection Guest House. Hostel Mostel is another great option for traveling vegans and vegetarians in Sofia, as they also provide vegetarian (vegan options available) meals! This is a great spot if you’re a solo traveler as they have a common area and common meals. Click here for current availability and rates at Hostel Mostel. Browse our many Vegan City Guides.